The first time you run Intego Virus Barrier, you will be asked what level of protection you would like to enable. The default protection level is quite suitable and is recommended for most users, but two additional options are provided. Just select one of these default coverage levels and you're done! All of the default protections that you would have selected in first run will turn real-time scanning on. This means that Virus Barrier will constantly be watching as files get changed or added to your Mac. This ensures that malware does not find its way on to your system without your knowledge. The Basic Help overlay will appear once you have chosen a level of protection for the first time. This overlay points out the main features of VirusBarrier. (Note: You can access this Basic Help menu at any time by clicking Help in your top menu bar and selecting Basic Help). VirusBarrier's anti-malware protection works in several ways. Its Real-Time Scanner constantly watches over your Mac, protecting you from viruses and malware. The Real-Time scanner ensures that your Mac is protected at all times by scanning every file that is created, copied, modified or saved. It does not, however, scan other files. This is why we suggest you run a full scan of all your files when you install VirusBarrier and after each update to the program's virus definitions. 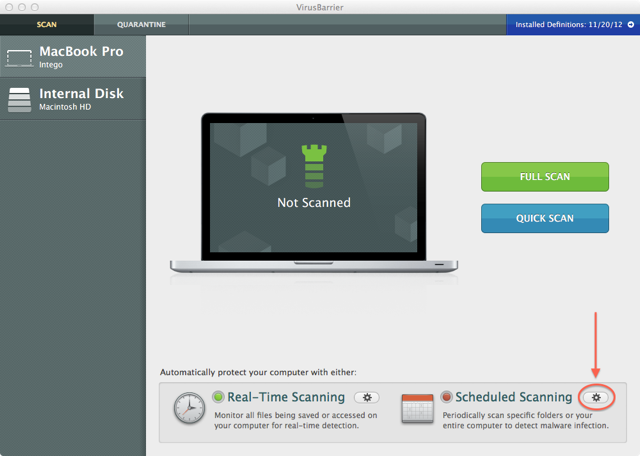 You can also use VirusBarrier's On-Demand scanner to check any file, folder, disk, or volume on your Mac. You can run a manual Full Scan with VirusBarrier whenever you want. You should do this immediately after installation to ensure that you don't have any infected files; the VirusBarrier Setup Assistant offers to do this after you first set up the program. 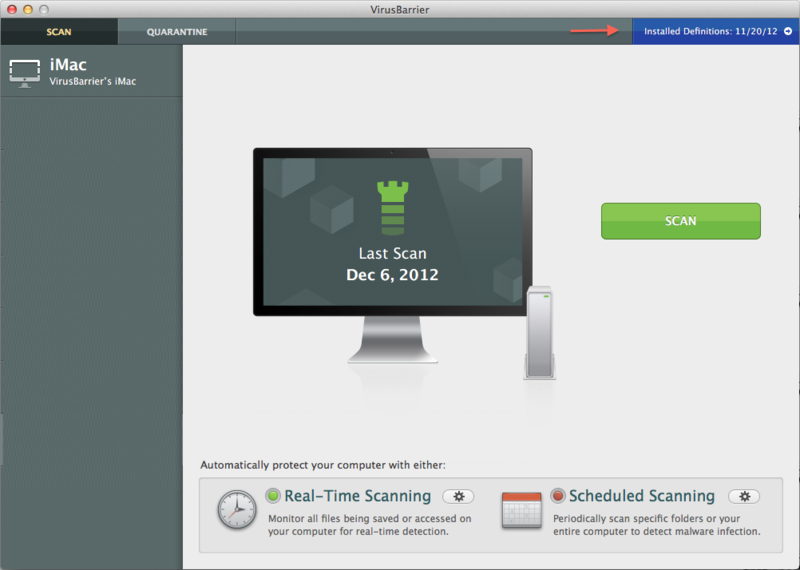 After that, VirusBarrier's Real-Time scanner ensures that any new files you add to your Mac are safe. VirusBarrier lets you run Quick Scans, which scan only those locations where malware is commonly installed. The files and folders scanned may change as new malware appears, and the locations scanned may be different with newer versions of VirusBarrier's virus definitions. 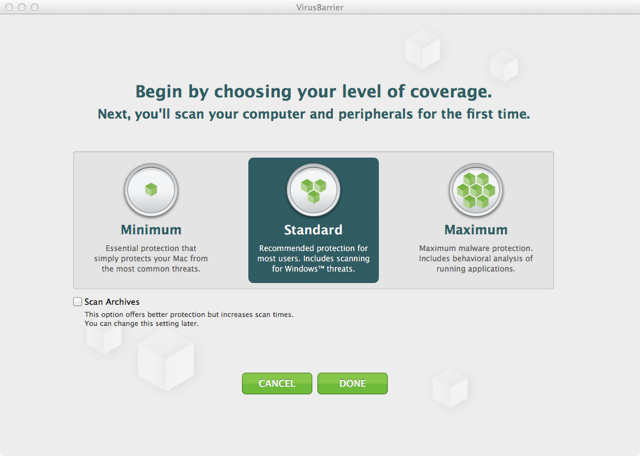 To run a Quick Scan, launch VirusBarrier and click the Quick Scan button. (Note: The Quick Scan button only appears when you select your entire computer in the left column). If you want to scan only a single volume connected to your computer using VirusBarrier, you can highlight the volume in the left column of the window and click the Scan button. When a malware is found you will be notified immediately. It depends somewhat on what malware is detected, but you will generally have 3 options. You can choose to Trust, Quarantine or Repair the malware. If you want VirusBarrier to repair the file, click Repair; to put it in the Quarantine Zone, click Quarantine. (See the Quarantine section later in this manual for more details.) If you do not want to do anything, click Trust, and the file will not be repaired. WARNING: Ignoring virus warnings can be dangerous! Only select to not repair files if you are sure of what you are doing. To turn off the Real-Time Scanner, move the Real-Time Scanner slider to OFF; you can turn it back on by moving the slider to ON. In normal operation, you will not need to disable the Real-Time Scanner; this is only useful for troubleshooting when you have a problem with your Mac. Ask what to do: this is most appropriate when you're running a virus scan on an "attended" Mac; that is, one that you're watching closely enough to see the alert when it pops up. Note that if you don't respond to an alert within one minute, VirusBarrier places infected files in the Quarantine Zone. Place file in quarantine: this ensures that the file cannot be opened or read. See the Quarantine Zone section below for more about using the Quarantine Zone. Attempt to repair: this tells VirusBarrier to attempt to remove the malware. If for any reason the file cannot be repaired it will be placed in the Quarantine Zone. In addition, you can choose to have VirusBarrier send you an e-mail whenever it discovers a virus or malware. To set this up, check the Send e-mail to checkbox, then enter your e-mail address and click OK.
Once you have switched the Schedule to "On", you can create Daily or Weekly scans for any time you like. Clicking the Advanced button allows you to customize your Scheduled Scans. For example, you can choose to scan specific files or folders, and create multiple Scheduled Scans if necessary. If you don't want to repair files automatically, you can have VirusBarrier put them in its Quarantine Zone. When files are quarantined, they can't be opened or read, ensuring that they cannot infect your Mac. This is useful for administrators who want to check files before running VirusBarrier's repair functions. 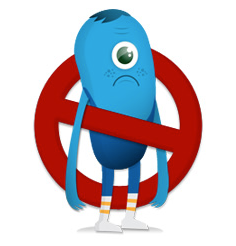 VirusBarrier automatically places files in the Quarantine Zone if you don't respond to an alert within one minute. You can then check these files and decide what to do. The Quarantine tab at the top of VirusBarrier's Overview screen shows you which files are quarantined. You'll see a display that shows which files are in the Quarantine Zone, as well as a group of buttons allowing you to act on those files. To act on any of the files, select them and then click one of the three buttons at the bottom right of the window. Trust tells VirusBarrier that you think this file is not infected, and adds the file to VirusBarrier's Trusted Files list. This may occur for false positives. However, be very careful when you click this button: only do so if you are sure the file is safe. If not, it may infect your entire Mac. Probably a bad idea. Delete removes the file from your Mac. Repair tells VirusBarrier to remove the malware from the file. You can also see the file location path for the quarantined file in the bottom left corner of the window. VirusBarrier is designed to work unobtrusively in the background once it's installed. However, it has numerous options to let you control how its various functions run. You set these options in the Preferences window, which you reach either by choosing VirusBarrier > Preferences... or by pressing Command-comma on your keyboard. The Preferences window is divided into five panes: General, Scanner, Trusted Items, Advanced, and Feedback. Scan e-mails VirusBarrier scans incoming and outgoing e-mails, both for their content and any attachments they contain, during manual scans. Scan iPhone, iPod touch and iPad tells VirusBarrier to show any iPhone, iPod touch, or iPad that is connected to your Mac when you run a manual scan so you can choose to scan the device for malware. If this option is unchecked, VirusBarrier will not show any iOS devices in the main window. Scan volumes when they are mounted is triggered whenever you mount a new storage device, whether local (such as a hard drive) or remote (such as a network drive). If the Ignore read-only volumes checkbox is checked, VirusBarrier will perform the action only on those volumes where it could change the drive being scanned (for example, to repair an infected file on a disk). After malware definition updates:, lets you tell VirusBarrier what to do after the program downloads and installs new virus definitions. Virus definitions are updated regularly, and especially when new malware is discovered to offer protection against that threat. Therefore, you should perform a new scan at those times to check for the new malware, either manually or (by checking this checkbox) automatically. Mac OS X malware: this is dimmed, because it is always active. VirusBarrier always scans for Mac OS X malware. This includes all types of malware that affects Mac OS X, such as Word and Excel macro viruses; the other categories are types of malware that cannot harm Mac OS X.
Linux malware: if this is checked, VirusBarrier will scan for malware that affects the Linux operating system. Hacking tools are malicious programs that may not directly harm your Mac, but that may be used by hackers to attack other computers. It is especially useful to check this option if your Mac is publicly accessible. Keyloggers are programs that record all your keystrokes. While some such programs may be malicious, others may be installed intentionally to monitor computer users, such as children. If this is checked, users being monitored may be alerted to the existence of such software on their Mac. The first option, Remove quarantine marker after scanning uninfected files, tells VirusBarrier to remove a quarantine marker set by Mac OS X when applications are downloaded and VirusBarrier has found that they are not infected by any malware. This removes the Mac OS X dialog warning you that they were downloaded and asking if you're sure you want to open them. The second option, Behavioral Analysis, tells VirusBarrier to use Behavioral Analysis to keep an eye on suspicious activities performed by applications. If any application does anything that could be considered abnormal (such as deleting a large number of files, for example), VirusBarrier will alert you to this. Archives contain one or more files, usually in a compressed format, so that they can be transferred easily and quickly. VirusBarrier will look inside several popular types of archives, scanning not only the archive file itself, but also the files that it contains. By default, VirusBarrier will scan all archive types that it understands; however, you could choose to scan only certain archive types by unchecking different types of archives in the Archive Options list. The Archive timeout setting lets you tell VirusBarrier to stop scanning archives that take more than a certain amount of time to uncompress and scan. By default, this is set to 60 seconds. However, any files that have been uncompressed before the end of this timeout will be scanned. VirusBarrier offers the option to add files, folders or volumes to a list of Trusted Items. VirusBarrier will assume that these files are all safe and will not scan them. You should only use this for files that have already been scanned by VirusBarrier. Adding a folder or volume tells VirusBarrier to trust all files contained in the selected item, including in any subfolders it contains. Security: If you check Require administrators to authenticate in order to make changes to settings, only those users who can enter an administrator's password can make any changes to VirusBarrier's settings. Intego software periodically collects information about how features in its products are used to help improve their quality and reliability. All information collected is fully anonymous and cannot be used to personally identify any particular user or their behavior. There is no action required on your part for information to be collected. You will not need to fill out any surveys and will not be contacted by Intego regarding this information. The VirusBarrier log shows a record of malware activity that VirusBarrier has observed, including all manual and scheduled scans, and the results of these scans. You can filter it to highlight issues of interest. To access the malware log, choose Window > Logs from the top Menu bar, or press Command-Option-L. The log looks as follows, although of course your log will show different entries from this one. The colored dots in the leftmost column show you what types of entries are displayed in the log. Green dots indicate information, such as starting the real-time scanner or updating virus definitions. Orange dots are for warnings, such as stopping the real-time scanner. Red dots indicate threats, such as when infected or corrupted files are found. The files, folders or volumes selected for each scan are named, as are all problems found. You can copy any log items by selecting them and pressing Command-C; you can then paste them into another application, if needed. You can clear the entire log by clicking the Clear... button. To clear the log, and erase all information it contains, click the Clear... button in the lower-left corner. A dialog appears, asking you to confirm your request. When you launch NetUpdate, you will be notified if updates are available for your software, or if your software is up to date. Intego software comes with a license that allows you to use the software on at least one Mac (standard license), three Macs, or even more if you have a business license. When you install Intego software on one of your Macs and serialize it, that Mac is considered to be authorized for one seat of your license. If you have multiple copies of the software installed, and wish to use it on a different Mac, you will need to deauthorize the software for one Mac and serialize it on another Mac. Remember to deauthorize your Intego software if you sell one of your Macs and wish to use the software on a new Mac.